Please log in to your privileged BOSSDesk account prior to attempting the configuration steps below. 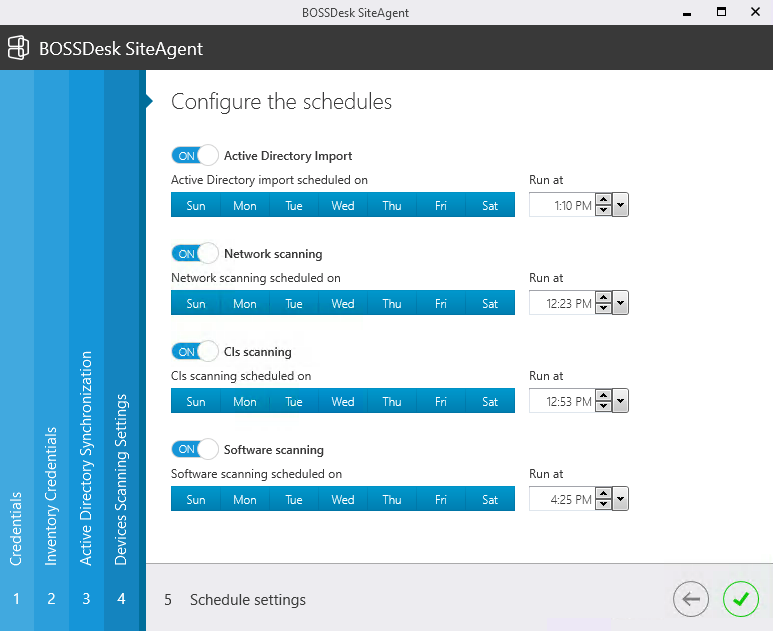 Select the "Settings" option from the BOSSDesk sidebar menu. Scroll to the "Account Management" section of the "Settings" page. Company Logo – Displayed on all BOSSDesk web pages. Company Name – This information appears on web pages, reports and e-mails. Welcome Text – Displayed on the BOSSDesk login web page. central location where services will be managed. Currency – Dropdown list of international monetary identifiers. Once you have set each of these items click "Save" to apply them. Click the "Settings" item in the BOSSDesk sidebar and scroll to "Email Settings"
Templates: Customize the e-mail content for specific process trigger points, such as user notification templates, the new Agent ‘Welcome’ e-mail message and the ‘Forgot Your Password’ e-mail response. Notifications: you can change the settings governing what types of changes notify your technicians or users here. On the "SiteAgent" Page on the right-hand side, select the "New SiteAgent" button. Enter a name for this instance of the SiteAgent (We recommend using the name of the domain) and click "Save". copy the displayed API key to somewhere for later use in the server installation. Return to the main "SiteAgent" page by clicking the "SiteAgent" tab at the top of the screen. Move the downloaded installer to the prepared Windows Server. Open a Command Prompt as Administrator (right click, "Run as Administrator"). Run the installer from the administrator command prompt, and complete the installation steps. Once the installation is complete and you click finish, a window should open prompting you to configure the agent. 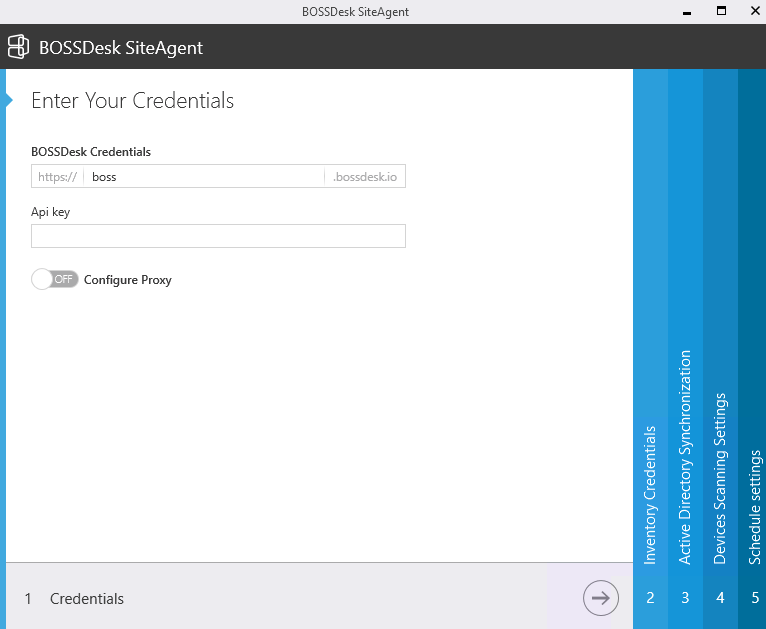 In the configuration window, enter the name of your BOSSDesk instance (what preceeds ".bossdesk.io" in your url) and paste the API key you copied earlier into the designated fields and click next. Enter the hostname for the domain controller, as well as the credentials for the domain user mentioned in the prerequisites into the allotted fields. then, select the number of threads you would like to use (default is 5), as well as what AD groups you would like to import for use in organizing your users in BOSSDesk, and click next. If the credentials were accepted, you should see a list of all of your Active Directory OUs in the "Active Directory" box. Check the boxes of the OUs you wish to import into BOSSDesk (You can also select or deselect specific users), then click the green arrow between the 2 boxes (the one pointing right) to move the OUs to the list to be imported. 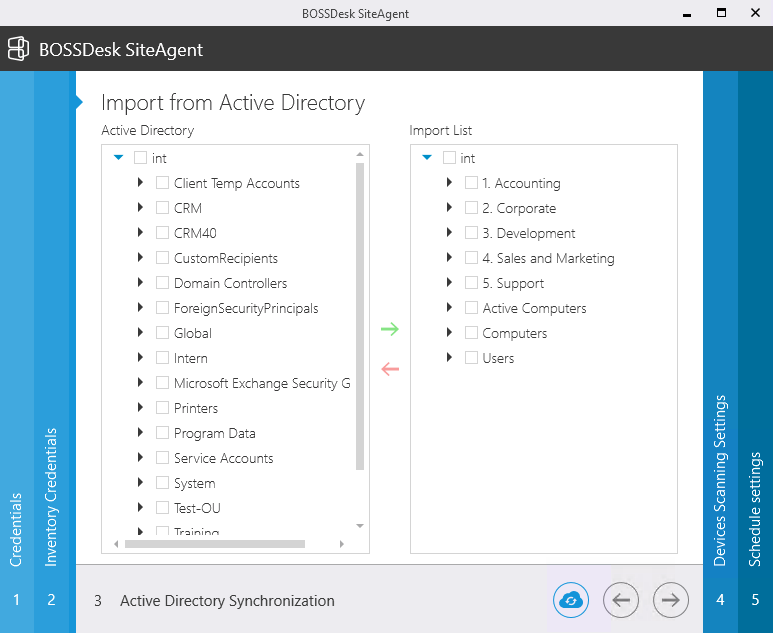 Once all the OUs you wish to import are in the "Import List" box, click "Sync Now" to sync these assets immediately to BOSSDesk, then click next. 14. 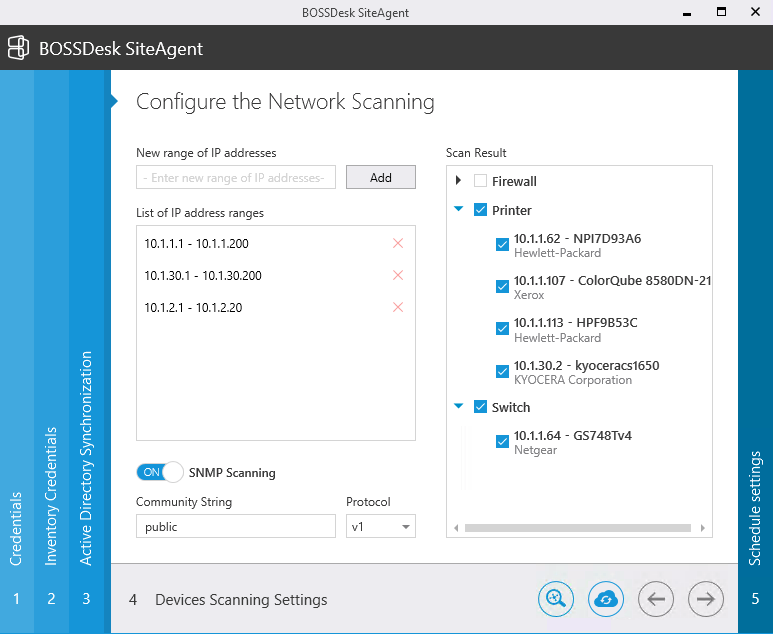 Enter any IP ranges you would like to scan for devices (in the format - ) and click add. 15. Once you have added all the ranges, click the magnifying glass to scan. 16. 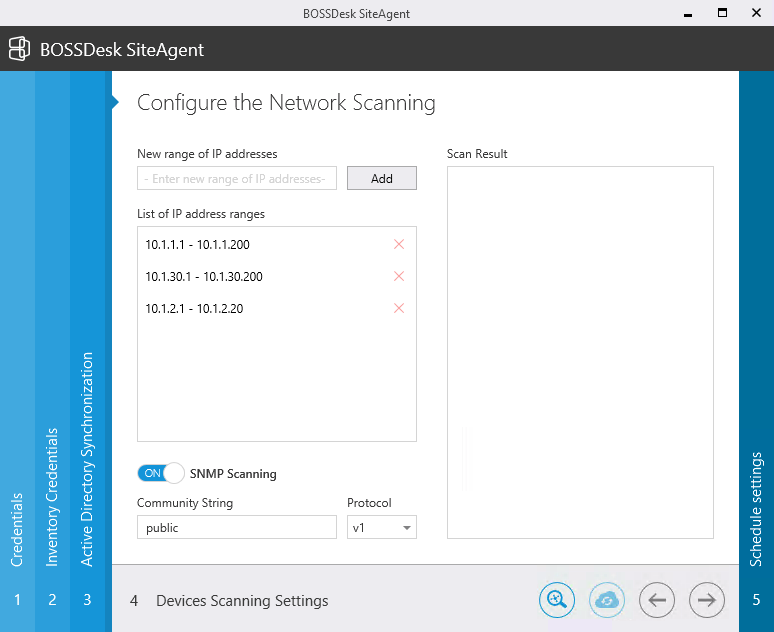 When the scan has completed, Select the devices you wish to add to your BOSSDesk and click the cloud button to sync them. 17. Once the sync is complete, click next. 18. Select which scheduled tasks you would like to turn on, and select what time and which days you would like them to run on. (Note: scheduled tasks cannot be run within 30 minutes of one another). Once the schedules are correct, click the green check mark in the bottom right corner to finalize these settings. 19. 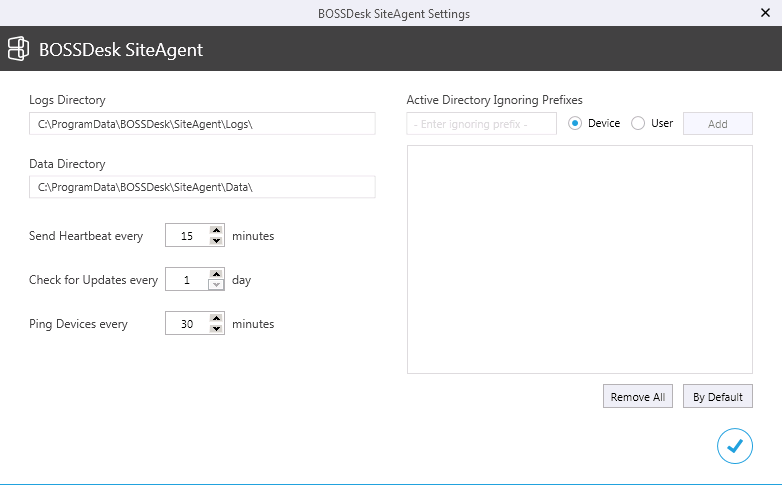 After the Sync is run for the first time, you should be able to see details listed next to the SiteAgent in your BOSSDesk SiteAgent Settings page. Go to the server the SiteAgent is installed on. Navigate to the system tray on the taskbar. Right click on the BOSSDesk icon. You have now completed the Basic Setup.